I never particularly liked home made pizza. 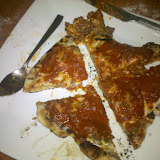 It always tasted a little funny, and distinctly non-pizza like. So, when I saw this, I was intrigued. The recipe seemed complicated and a little high falloutin’. So, I bought some dough, pizza sauce, mozerella, cheddar, and parmesean cheese. Then I mixed some garlic, olive oil, red pepper, basil and parsley with my hand mixer. I also had some ground beef which I mixed with some of the oil mixture. I threw the ground beef in some aluminium foil then dropped it on the grill. Then, I took the dough, brushed it with my garlicky oil mixture, threw it on the grill. Wait a little bit until it was blacked on the back. 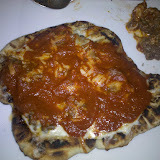 Flip it over, then put on the cooked beef, then cheese and finally some pizza sauce. Cook it until the cheese is all melty. Then eat! It turned out fairly well. Too much sauce, and the cheese was too mild. Also kind of burned the bottom. But, all-in-all, not half bad. Entries (RSS) and Comments (RSS).13 queries. 0.077 seconds.